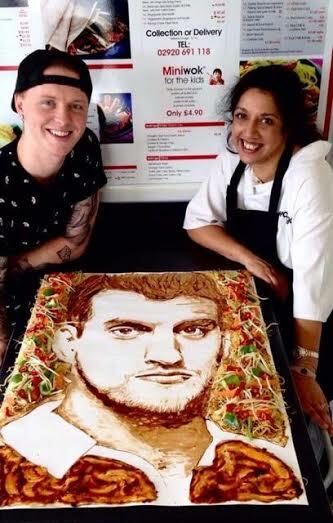 Welsh Britain’s Got Talent contestant, Nathan Wyburn is the latest to join a growing school of creatives getting their hands dirty by rustling up portraits using an array of tasty tidbits. Armed with chopsticks, oodles of talent and a popular dipping sauce of the soy variety, Nathan immortalised rugby hero and Welsh captain Sam Warburton today in one of Cardiff’s most popular Chinese restaurants, Wok To Go. With the nation taken over by rugby fever, Nathan has paid tribute to the Welsh captain by creating his portrait in one of the rugby stars local haunts. The portrait took two hours to complete and will be available to view in the restaurant for as long a possible due to the nature of the perishables used to create it.